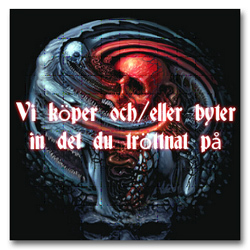 Welcome to TPL Records in Sweden, founded back in 1984. Yes we ship worldwide. When you have placed your order through our webshop you’ll get a confirmation email that says your order are in our system. Then wait until we get back to you with the total amount including shipping fees. All orders must be pre-paid before we ship your parcel. We combine orders to save on shipping. We PREFER bank payments from all Swedish and EU customers. If you prefer any other payments then please mention that in the message box on your order. . We ship parcels below 2kg with normal air mail which means that our parcels don’t come with any tracking number. If you want to be able to trace your parcel then we need to ship it with registration (an additional registration fee will be added). We prefer bank payments if possible but we also accept paypal payments. An additional fee will be added on paypal payments to cover the paypal fee. We ship parcels below 2kg with normal air mail which means that our parcels don’t come with any tracking number. If you want to be able to trace your parcel then we need to ship it with registration (an additional registration fee will be added). This fee is optional for most countries (see exceptions below) and if you want us to send the parcel registered then please mention this when placing the order. Parcels above 2kg will automatically get a tracking number. Customers from South and Central America, Asia (apart from Japan), Russia (incl former Russian states) and Israel HAVE TO pay for registration, due to many lost parcels to these countries. PLEASE NOTICE that these rates are approximate rates only because it happens that similar formats have varying weights. Registration fee is 9 euro. A dvd, cassette or a vinyl 7’ counts as a cd in postage. Double vinyls counts as 2 lps. For bigger orders or box sets please contact us.